Customize Facebook Timeline: Video Tips & More! Facebook Timeline is every where and new and interesting tweaks related to Timeline Layout customization are emerging. Yesterday we shared how you can create Cover Designs for your Timeline Profile and today we will learn new features added to Timeline and some customization tips and tricks. Understanding the new options and layout can be fun with Video illustration. The video tutorial will give you a great idea on how to change the default settings and make necessary security settings. But first lets learn some important tips. Facebook gives you a seven day period to customize your Timeline after which it will be set live and everyone will be able to see your new profile. If you didn't arranged your photos, videos and posts in timeline within this period then it will be setup automatically after 7 days. To see how your Timeline appears to your friends then click on the gear menu at the top and choose "View As". 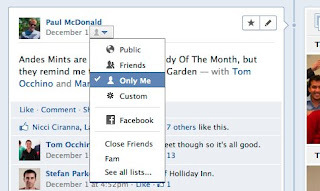 You can choose how it appears to everyone/public or to any specific selected friend. You can also hide or show individual posts. If you think you don't want a particular post to be shown then simply click the button just below your name and choose "Only Me". This will not delete the post but will be invisible to your friends and visible to you. There are some memorable posts or photos that you would always want to set as feature post. Timeline gives you the option of featuring your best moments and also lets you to choose who may view it. You can also hide some posts that you don't want others to see. 5. See everything with Activity Log! 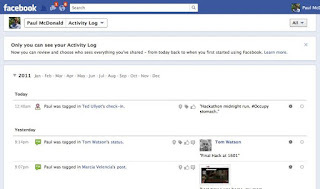 Active Log is a brilliant new tool that lets you see all your activity on Facebook. You can see all your posts, comments, photos and everything that you did on FB dated back to the days you started using Facebook for the first time!. 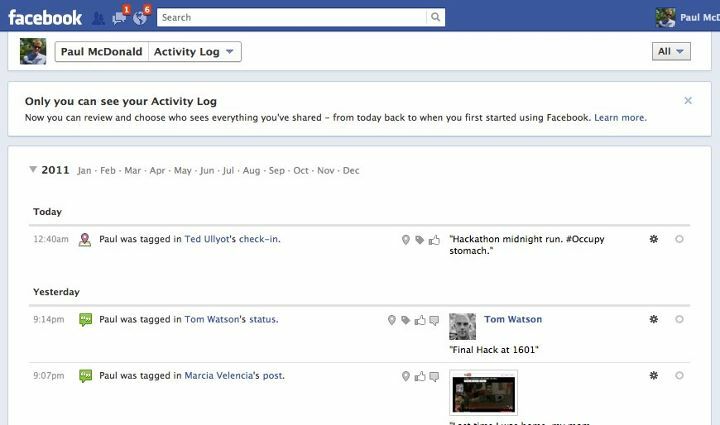 You can choose to hide, feature or delete any of your posts from your timeline using activity Log. You can create and design amazing Cover photos and add them to your timeline. Cover is the wide photo featured at the top of your profile which everyone can see. Please check the following post for amazing ways of making a Hot Cover Design for your profile! If you liked what we shared then please share it with your friends on Facebook and let everyone explore new exciting tweaks! Why Zukerberg Wont Let you disable Timeline? Bro.........I need Ur help. I have been avid reader of ur site and infact Ur blog is the backbone of mah one. But bro i encountered a problom regarding the READ MORE button. Actually everything was fine and i never even touched the HTML after adding the Read more button on mah site. But bro it worked fine for almost 5-6 months but since last 3 posts i've been encountering a problom. The read more button is showing up all right but only after the whole post. plz help me out bro. hey bro.........thnx !! i was able to solve the problem. As soon as i posted mah problom here i struck and idea and it really helped. ur site is really lucky for me bro thnx again. Hey google change all blogger blogs image view...click on any image of post and see d new difference. @Mohammad is it okay to edit the old post titles of posts published which are not getting traffic or are not well optimised? Facebook continues to sink its teeth into our personal lives. And while the redesign is a welcome change, there are some glaring issues that can’t be overlooked. I LIKE THIS WEBSITE FOR FACEBOOK TIPS.